Is there anything the human race won’t stick on the side of an iPhone? We’ve seen duct tape, pistol-shaped plywood, forks and vinyl. And now, this. 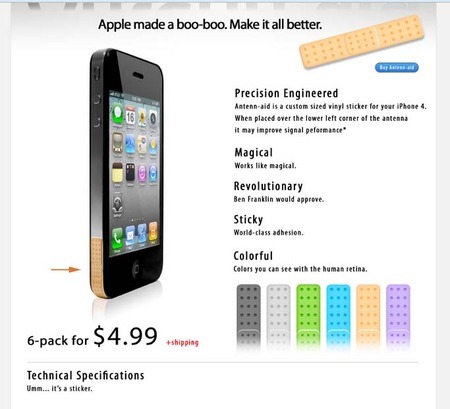 Well TBH, the release of an iPhone 4 sticking plaster isn’t much of a surprise. So meet Antenn-Aid, iPhone 4-correcting and amusingly designed to look like a plaster. Americans, and it seems Australians, Canadians and Indians tend to use the brand name Band-Aid to describe any plaster, see Wikipedia here, so this joke is more amusing to them, but we’ll bear with them on this one. They say that the adhesion is “world class”. At only $4.99, it’s slightly more expensive than buying a normal “band-aid” and taking a pair of scissors to it. Is it really a joke..?